Nintendo games are engrossing, says Nintendo of America's head honcho, but fight against a lot of other things for people's time and attention. If you thought that Nintendo's competition only came from the likes of Microsoft, Sony, and the rising star of Apple, then guess again. 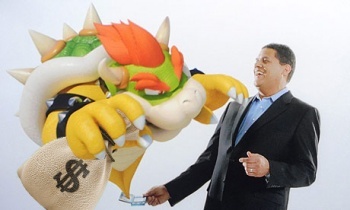 Fils-Aime says that Nintendo's competition extends much further than other platform holders. In fact, he considers anything that distracts people from playing Nintendo games to be a potential competitor. Fils-Aime said that it all came down to how people spent their time, and Nintendo's competition included everything from FarmVille to surfing the internet to reading the newspaper. He didn't discount other manufacturers however, and thought that Apple especially could make hurt Nintendo in the short term, even more than the likes of Microsoft. But he feels that Nintendo has the edge over Apple, and said that while you might spend a few minutes playing Angry Birds or similar casual games, you could lose hours playing a game on the DS. NIntendo has had more success than any other console maker in getting people to accept videogames as a valid way of spending their time, and with the more robust online features on the 3DS, it seems poised to try and inject itself more and more into people's day-to-day lives. The company has already made deals with Japanese TV channels to show video content on the 3DS, and is looking into streaming magazine and newspaper content as well. If it is able to make similar arrangements in other countries, you could be spending an awful lot of your time looking at your 3DS. The 3DS comes out in the West next March.